The Coronado Cays is surrounded by natural beauty and wildlife. It’s one of this boating community’s charms. Gulls are among the most common seabirds that swoop in and out of the Cays channels. These white and gray birds are subjects for photographers and artists alike. 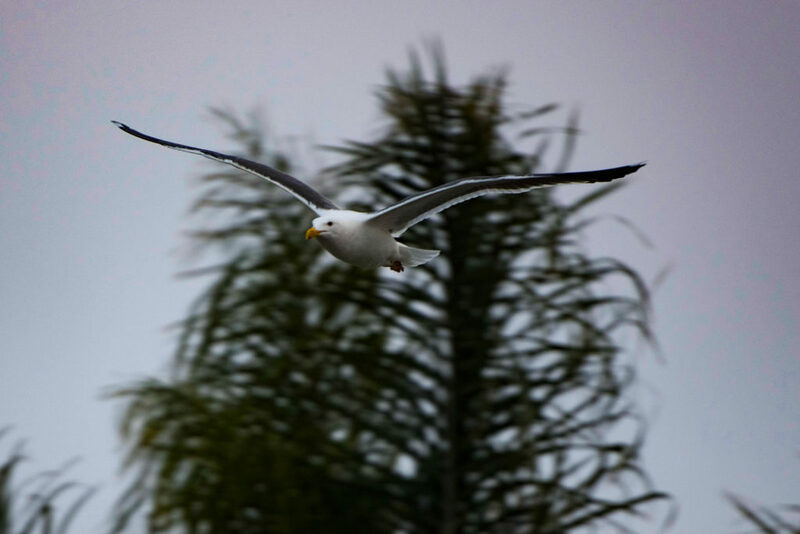 Brian Lippe, Cays resident and photographer, often captures these graceful birds mid flight. 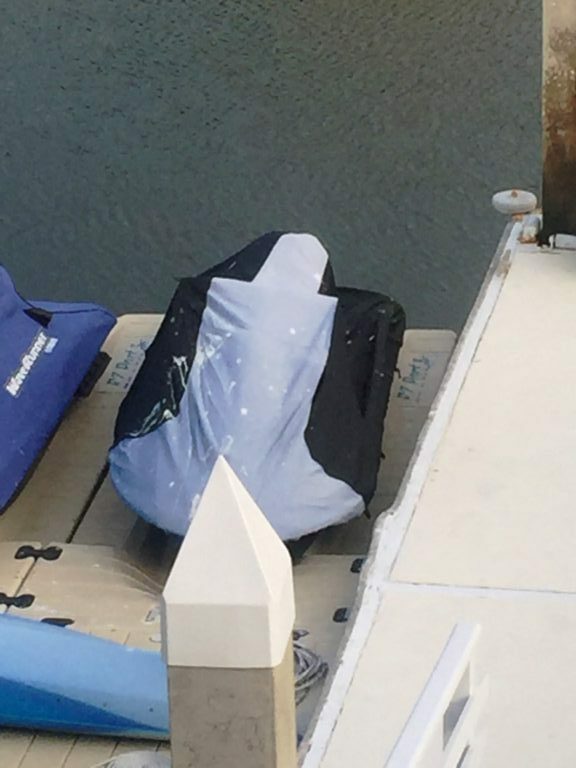 An array of animals have been spotted taking a break on the docks in the Cays: seagulls, Osprey, the occasional seal, snakes, coyotes, and a … T-Rex? Though the seabirds can be a pleasure to observe, what they leave behind isn’t pleasant at all. 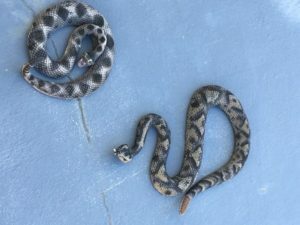 In an effort to coexist with the waterfowl, Cays residents have come up with unique and funny ways to combat the assault of the seagulls, and other unwanted animals, that also call the Cays home. 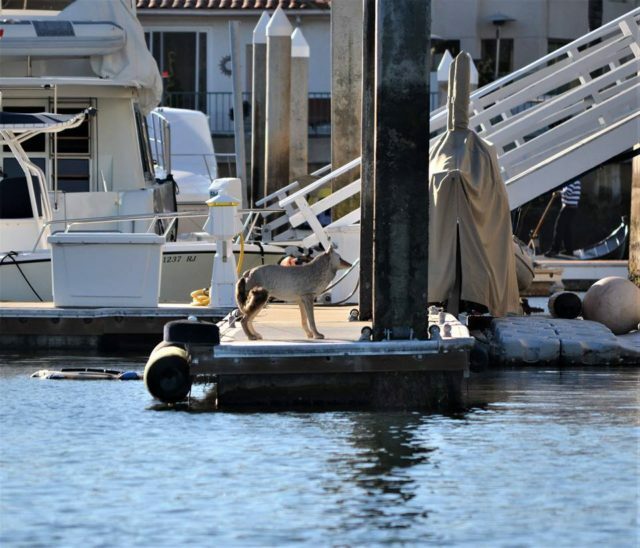 One of the odd sights in the Cays channels is a coyote keeping guard on the docks. Does it work? Bailey the guard dog likes the idea – the Border Collie was trained as a seagull security guard for the Australian National Maritime Museum in Sydney, Australia. He spends his days chasing after the pesky birds, and wears a life vest because he often ends up running off the end of the quay. Others use more traditional methods like spikes and wind propelled bird repellers with questionable results. 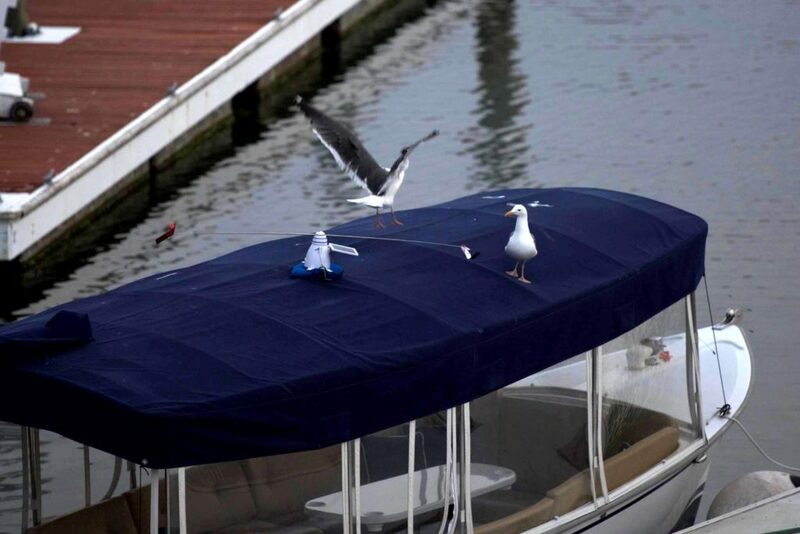 Seagulls are the most frequent nuisance in this waterside neighborhood, and they can sometimes be downright aggressive. Patty and Omar Gonsenheim report that a seagull was intent on plucking their pooch from their dock and making off with him! Thankfully the seagull failed, but the incident made the dog owners take matters into their own hands. To scare off the birds, they placed menacing looking snakes on their dock. Though uncommon, the Gonsenheims aren’t the only ones to witness this type of behavior from the flying carnivores. An online search revealed similar incidents involving small dogs that fell prey to seagulls. Are you envisioning Alfred Hitchcock’s The Birds movie yet? Other frequent visitors to the Cays are Osprey. 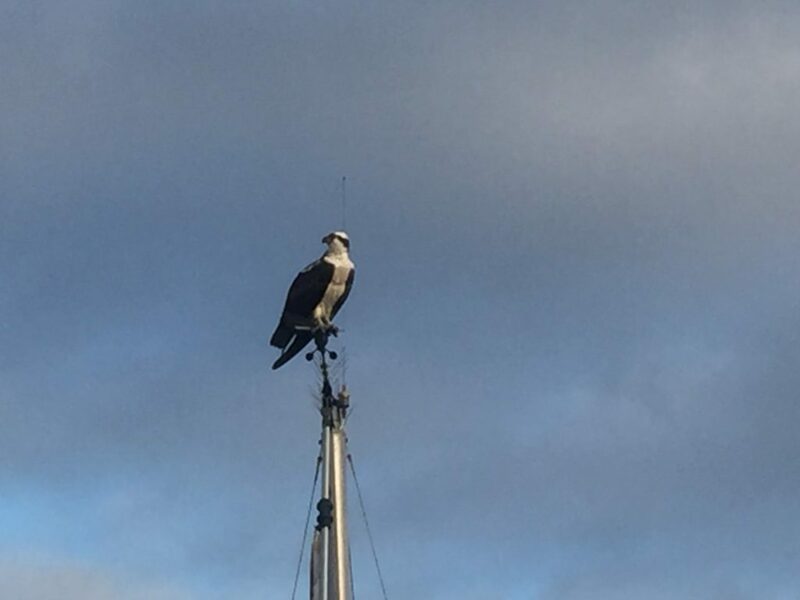 Spotting the large black and white birds perched regally atop a boat mast must be a treat, right? Wrong. According to Patricia Guinea, the momentary majesty of this fish-eagle sighting quickly passes after hearing the bird crunch on its prey’s bones – and later noticing the end result of its visit on their jet ski’s cover. The Guineas haven’t been able to figure out how to avoid the visits from their large feathered friend. “This one looks bigger this year,” said the boat owner. So they’ll put up with the mess for now. Other residents are not as patient with the local wildlife. 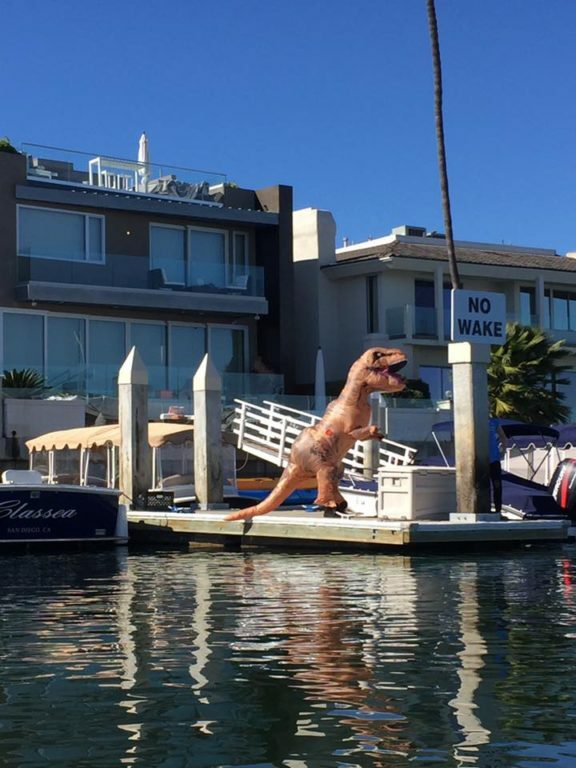 One Cays resident chose a prehistoric guard as a solution to unwanted dock visitors. A formidable T-Rex looks down the channel ready to scare off anything that dares to come close. 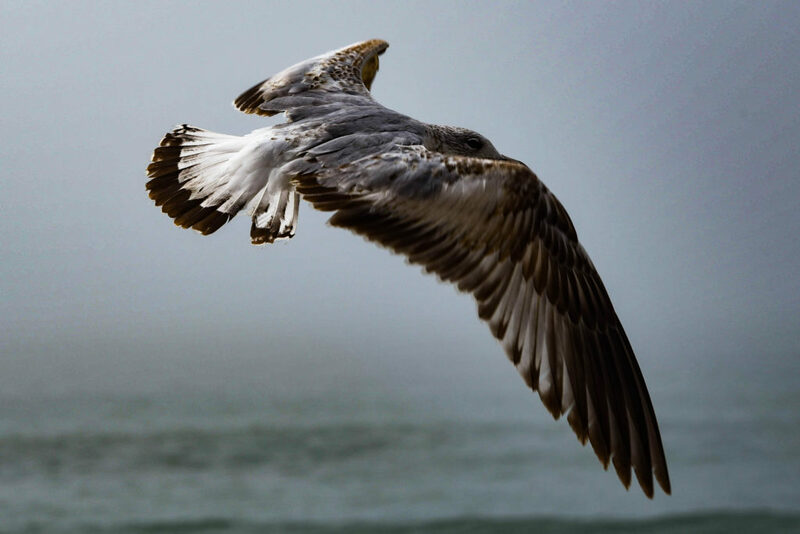 One might imagine the seabirds gliding serenely with their wings outstretched out to the farthest areas of the ocean. But for some Cays residents, that’s not far enough. Do you have tips to share about how to deal with these avian problems? 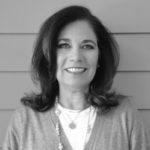 “Only in the Cays” is a recurring column. Contact us with your story suggestions.